Are you looking for an affordable and trusted chauffeur driven private charter service for Gold Coast airport transfers to Main Beach? Don’t look beyond GC Direct Charters. 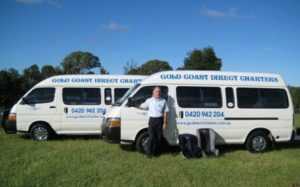 Looking for a private charter service to travel anywhere between the Gold Coast Airport and the Main Beach? We are here to help. At GC Direct Charters, we have decades of experience in providing people with hassle-free and affordable transportation services. From the Gold Coast Airport to the Main Beach and anywhere in between – we make travelling simple and stress free. With a large fleet of insured vehicles, fully trained drivers and highly efficient customer support team, we do everything possible so that you reach your chosen destination safely and on time. Our private charter services are tailored for both individuals and groups. We give topmost priority to customer needs and requirements and our team is always ready to offer full assistance 24X7. Our drivers are not only smart but fully trained and licensed. We train our drivers in the latest technological advancements and they have in-depth knowledge of the all the local routes. Not only our drivers are highly professional but they also follow high safety standards and all the traffic rules. All you need to do is book a ride and we will send our drivers to pick you up on time. With a large fleet of airport verified, police checked and insured vehicles, we are well equipped to provide chauffeur driven private charter services to both groups and individuals. In case of group airport transfers, we have the capacity to provide transportation services for 21 people at a time. Whether you are looking for comfortable sedans, luxurious Limousines or minibuses, trailers, Toyota Coasters for group travels – we have it all. Regularly inspected and well maintained. Spacious luggage load to accommodate everything. Free booster and baby seats on prior request. What are you waiting for? To book a ride or to know more about our private charter services for Gold Coast airport transfers to Main Beach, contact us today.